To all you going to Singapore to witness the *ONLY* F1 night race then hereâ€™s more good news baby! Ho Ho Ho! Check it out!Â I know some people might not dig museums but hey, itâ€™s free mate!Â Singapore is very diverse in culture and once you enter Museums, you will discover not only the culture of Singapore but also the culture of people who came to stay Now I really donâ€™t know what Iâ€™m talking about because I havenâ€™t been to any of these museums myself even if Iâ€™ve been to Singapore like 3 times.Â So, feel free to prove me wrong yah?Â Or better yet, I get lucky and be sent to Singapore myself so that I can enjoy this freebie with you If you are already a Formula one ticket holder, you will enjoy complimentary entry to all the local museums from September 24 â€“ 26, 2010. ZOMGosh! I havenâ€™t gone TGST TGST TGST outside the Philippines so hell yeah! Iâ€™m going to this one fow shyo!Â Thatâ€™s if Iâ€™m going lol.Â But for all of you going to Singapore to watch the Grand Prix and you are a Singapore GP Formula 1 ticket holder then you are in LUCK! 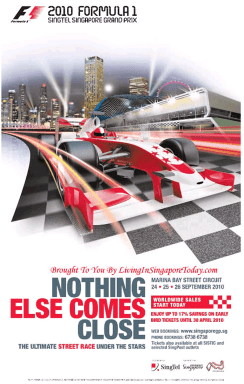 â€¢ 1-for-1 for all loose drinks at Wine Bar throughout the entire Grand Prix Season Singapore 2010. Like I said, party time! Party the night away post-race at The Butter Factory this Grand Prix Season Singapore 2010. The first 50 ticketholders for the nights of 24 and 25 September will enjoy free entry. Boogie throughout the evening with hip hop and RnB, and watch a B boy dance battle on the night of 25 September in the Bump Room. Or flash your Fash and dance to electro-house and rock-tronica remixes. Make your way down to the Butter Factory this coming September to party like thereâ€™s no tomorrow. and hey!Â Singapore is a place of walking and shoppingâ€¦ Believe me, if you tour around, youâ€™ll carry stuff from shopping and walk a lot!Â You need some pampering in the island. Now, all these information I just grabbed from YourSignapore.com so do visit the site if you want more information! You are not heading over this year?